The neighborhood near the Guadalupe Landfill is worried about traffic and fear the smell from the landfill will only get worse. Hundreds of residents who live near a San Jose landfill are fighting a recently approved Waste Management contract that calls for 200 tons of trash a day to be dumped at the landfill. The Milpitas city council in April awarded Waste Management a new deal that allows up 22 more trucks to drive the trash to the landfill off Camden Avenue in San Jose. The changes are scheduled to take effect in 2017. "When you look at the number of vehicles here already, and there is only one way in and one way out, and then you will have more speeding through a residential neighborhood," San Jose-resident Joanie Santos said. Neighbors on Wednesday went door-to-door passing out fliers, letting people know about their concerns. Paul Rosynsky, Waste Management spokesman, said the landfill used to accept 200 tons of trash before 2012. 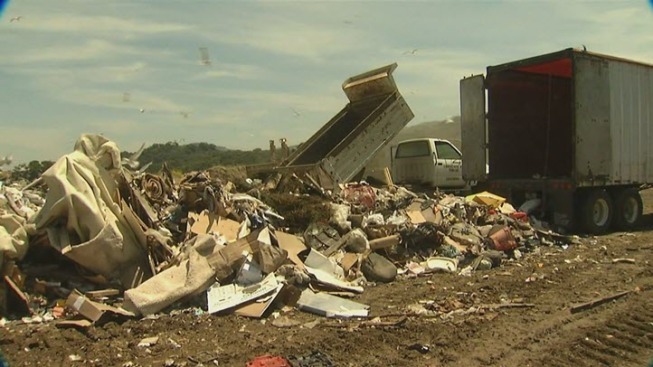 In addition, Rosynsky said the additional garbage from Milpitas will bring the landfill to accepting 1,200 tons a day, which is less than it took in before 2012. Rosynsky also said the stench residents are concerned about is not coming from the landfill. "That's the biggest joke I've ever heard," San Jose-resident Michael Drliaca said. "Where else would it be coming from? Is there anywhere else with dump trucks coming into the area?"